Each year on Memorial Day weekend Save the Harbor/Save the Bay release our annual water quality report card for the Metropolitan Beaches from Nahant to Nantasket, including beaches in Lynn, Nahant, Revere, Winthrop, East Boston, South Boston, Dorchester, Quincy and Hull. In 2017, weekly water quality testing at Boston’s regional beaches began on Memorial Day Weekend. Supplemental daily testing of Constitution Beach, King’s Beach, Malibu Beach, Tenean Beach, and Wollaston Beach began on June 19, 2017. Testing concluded on Labor Day weekend, September 4th, 2017. 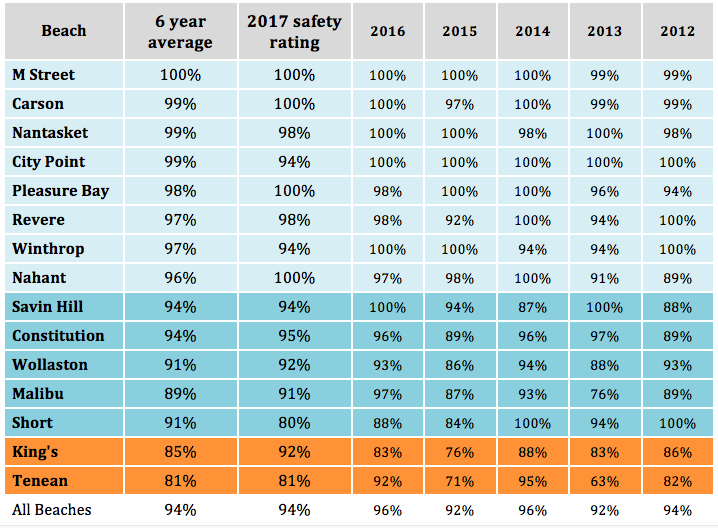 In 2017, overall water quality safety rating for Boston Harbor's regional beaches was 94%, the percent of time beaches were assessed by Save the Harbor/Save the Bay to be safe for swimming. This was a slight decline from last year’s score of 96%, but unusually dry weather in the 2016 sampling season likely led to relatively high scores for that year, as rainfall and the associated polluted runoff from streets and storm drains often has an adverse affect on water quality. The total rainfall during the 2017 sampling season was more than double the previous year, and the distribution, frequency and intensity of summer storms were somewhat atypical. This year’s report card contains mostly predictable results but comes with a few surprises. Once again, Tenean Beach in Dorchester was the lowest-scoring beach in the region while some other area beaches saw declines in water quality in 2017 over 2016. There was interesting news from King’s Beach in Lynn and Swampscott, which has consistently lagged behind other area beaches in water quality since 2012, when we began this project. King’s scored 92% this year, compared to last year’s 83%. 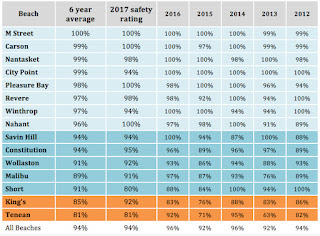 While this year’s results may well be an anomaly, working with EEA and Save the Harbor’s Beaches Science Advisory Committee both Lynn and Swampscott have planned improvements to their sewer and storm water systems, which we expect will result in significant improvement in water quality on King’s Beach. It was a relatively rainy swimming season for Boston Harbor; the seasonal rainfall total was 12.1 inches, which is markedly higher than last year’s 5.3 inches. There were several large rain events during the 2017 swimming season, three of which were greater than 1.25 inches of rain. Though the average daily rainfall for the summer was 0.13 inches, more than 25% of the rain came in just three storms. This variation is why we are reluctant to draw conclusions from a single year’s sampling results, though we understand why it’s interesting to see where water quality improved or declined versus the previous year. However, 2016 was a particularly dry year. Changes in the intensity and frequency of summer storms may well explain the variations we saw on some of our beaches in 2017, which is why we urge the public to use the multi-year averages we have provided in comparing relative water quality among beaches. To download the full 2018 Metropolitan Beaches Commission Water Quality Report Card, click here.